IWTYAL 173: How many hours a week do you study? Remember that the success you have depends much more on the range of activities you do – speaking, reading etc. Are those considered studying? Olly: Good morning everybody, welcome back to the I Will Teach You A Language podcast. Thanks so much for being here. Here in London we are getting the first signs of spring today. It is quite nice, I am sitting here in front of an open window, you can probably hear the noise outside. It is about 15 degrees, a nice breeze. It is that time of year, things are looking positive. It has been quite funny recently, we've been testing my new conversations project which I have mentioned many times here before. We've got a special facebook group, some of you may be in the group even. Over a hundred people are in there now testing the samples of material that are currently in French Italian and Mandarin Chinese. And it has been so funny seeing the different reactions from people because to exactly the same material you have so many different kinds of feedback. One guy said, “Olly I have got to be honest, I didnt enjoy these at all”. [laughs] And then someone else said, “I am really loving working with these materials, thanks so much for making them”. And then someone else said, “Olly you asked whether we would want to study with this kind of material, and the answer is a resounding yes”. And then everything in between. So, it has been so interesting to see that and I'm obviously really looking forward to getting this out in to the world. It is still a few months away currently, at the time of recording. Because basically we are working with the samples right now and then once we get all the feedback we are confident that the product is as good as I want it to be then that is the point where we then develop the full thing with all the dialogues and everything. That is going to take, obviously, some time. But the aim of this is really to make this in to the go to resource for listening practice in a language. So, if you start learning French, for example, and you really want to be able to understand native speakers in French, where do you go? What do you use? And this is going to be the resource that you need across different levels. So, you have your resource for A2 for B1 for B2. Different proficiency levels, a solid collection of material. I am really really excited about it. But anyway, enough of that I am sure you will hear a lot more of that in due course. 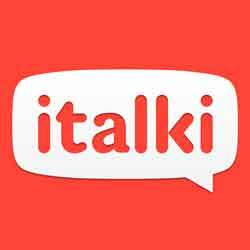 I would like to thank the sponsor of the show, who are italki of course as you know, and they are the place that I get my language lessons every week. And if you want to get a free lesson with a professional teacher you can go to iwillteachyoualanguage.com/freelesson. I highly recommend you do. Now, let’s get straight in to today’s question from Selman. Selman: Hello Olly Richard, my name is Selman Jaffer. I am from Algeria. First of all, I really want to thank you for your podcasts because are very useful. I kind of take them as a sort of motivation. Before I was just lack motivation, when I discovered your blog I became full of motivation. I really listening to your podcast entitled, “How I can stay motivated in my language learning”. Frankly speaking I fix problem because of this episode. Briefly how many hours a week do you spend to learn a language? Olly: Hi Selman and thank you so much for your question. It is great to hear from you and I am so pleased that the podcast has helped you and especially that episode on motivation has helped you solve your motivation problem. That is so cool for me to hear, so good work. Congratulations and keep it up. Selman, you have asked a question that has never come up on the podcast before. Which is awesome, which is how many hours a week do you study? Now a related question is how many hours does it take to learn a language or how many hours of study. There are lots of estimates around this, The Foreign Service Institute in the US has classified languages and said how many hours of study are required. Personally, I think it is mostly meaningless because it totally depends what you do, everybody is different, everybody is in different situations. So, I am not going to answer that question of how many hours does it takes to learn a language because I don't think you can really. But what I am going to talk about is me and how much time I spend learning languages. So, here is what I aim for. My ideal week is like this: Every morning I study for one hour, that is it, every morning I study for one hour basically and that is kind of focused concentrated study. Throughout the day, depending on what I am doing, I would then kind of look at flash cards and I will do some listening as well, if I am on the train for example. Sometimes I stay at home so I don't have any dead time, but if I do then I will spend time on flash cards and listening and that can be anywhere from nothing to 60 minutes. And then I try to have at least three speaking sessions during the week, which can last from 30 to 60 minutes. So, in total we would be looking at about five hours of study and three hours of speaking. And on top of that you would then add things like watching tv, reading books, going out and meeting people, et cetera et cetera. So, it really kind of depends how you define study. The thing is for me you can have 10 different people studying for an hour each and they will do totally different things. So, there is no such thing as studying as such because that means different things to different people. Some people study really well, other people can study for hours and kind of waste their time. So, that is why I really like to have one hour of focused study in the morning. Because it happens in the morning, I am fresh, it’s before I start the day so I don't get distracted. Whatever the precise activities that I am doing, I try to make sure that I am really really focused for that one hour. My friend Alex Rawlings said to me once that, “One hour a day of study is about the maximum useful time.” and I always found that interesting. It seemed quite low. But I know what he means now and I kind of agree with that. If I study for more than one hour it is like I almost learn too much stuff and I can’t process it. So, I like to aim for this one hour in the morning and I don't do it every day, I do it maybe five days a week and maybe not do it at the weekends. But those one hour sessions in the morning are the kind of engine of my learning and that has to happen. If you don't do that then what are you left with? Well you are left with grabbing bits of time here on the train or on the bus or whatever. Maybe the odd speaking session. You have to study if you are in the learning phase. And so, that is why I like to have this dedicated time. So, we will be looking at anywhere between, I would say, about five hours of study and maybe up to 10 hours of total time spent with the language every week. Now, here is the thing. I don't do this all the time. I've talked about my ideal, but I would often have things happen in my life that means that I can’t study. So, for example, I did not study yesterday. I did not do any Cantonese yesterday because I was coming back from my parents place out in the countryside. I had a lot of work to do and I didnt do any Cantonese yesterday. But that is fine, you have to take days off and you can’t be too hard with yourself as someone recently reminded me on a comment on a blog post. I don't stick to this schedule all the time. Some hours I don't do any speaking. For the last week, I did not do any speaking, for example, because I was travelling. And that is okay. But what I find is that whatever happens in my life, however busy I am whatever else is going on, the schedule that I have described to you here is pretty much what I tend to gravitate back to because I find it is the most effective. It is an hour a day of focused study, three speaking sessions, and then as much kind of extra stuff as you can do during the day in your dead time. This is what I do when I am actively learning a language. Now, for languages I already speak fairly well I don't really study them anymore, I just use them. And for this I don't really call this learning a language, I just call this using living maintaining a language. Whatever you want to call it. So, the schedule that I have talked about is really what is happening when you are actively learning a language. Which I guess some of you are probably English right now. Many people have this attitude and I have had this before as well of thinking, “Okay if I could just study for six hours a day I would be fluent next week.” But it doesn’t work like that. Study is the foundation, you have to study. But your success with a language depends so much more on the wider range of activities you do. Okay you are studying, great. But are you speaking? And are you speaking with people who will speak to you in that language? Are you reading books? Are you going back and reviewing the things you have studied? One of the things I like to do when I have time and when I remember is at the end of the day is actually add a little kind of review session. So, I would sit down for 10 15 minutes and just go back and look at the things I studied that morning, that really helps consolidate and really helps you remember things. For me the question is not so much how many hours do you spend studying, but how are you studying? Are you studying in a smart way? And that is really what I try to focus everything, all my work here on the blog on the podcast on is getting you to study as smart as possible. But for most people if you aim for an hour a day and you really focus and you apply the methods that we talk about here on the podcast you are going to find that you succeed. Now, of course, you may go abroad and you may go to some kind of immersion environment where you are surrounded by the language all day every day, and that is great if you can do it. Most people can’t. So, it is difficult to talk about that and be relevant. Thank you for your questions. I'm going to hope that was helpful. I hope that gives you an idea of whether you are on the right lines or not, whether you are doing the right thing. If you would like to read a transcript of this episode you can find it at the show notes. Literally every word I have said you can read along, which is a great study technique. And you can find that at iwillteachyoualanguage.com/episode173. Now if you would like to leave me a question, like Selman did, then you can do it and you can do it by going to iwillteachyoualanguage.com/ask. Now at the end of every episode I like to leave you with a resource of some kind on the show. In the spirit of this question of how often do you study, what is your routine. One of the most impactful blog posts I've ever written is called, “Core Study Time in Your Language Routine” and it is all about, we have actually been talking about this in the last few episodes. It’s about how do you study in the most effective way. So, go and read that blog post because it sums up everything that I have been talking about here and I describe my routine in lots of detail. Again, to read that blog post you can find a link to that in the show notes. One more time, that is iwillteachyoualanguage.com/episode173. Thank you so much for listening and I will see you back in the next episode of the podcast.